Tengu 天狗と伝説 Tengu legends "Long-nosed Goblin"
Tengu, a class of supernatural creatures found in Japanese folklore, art, theater, and literature.
. Tengu 天狗 "heavenly dog" . kotengu　小天狗 minor Tengu, crow-like goblin .
. Kaze no Kami 風神としての天狗 Tengu as God of the Wind . 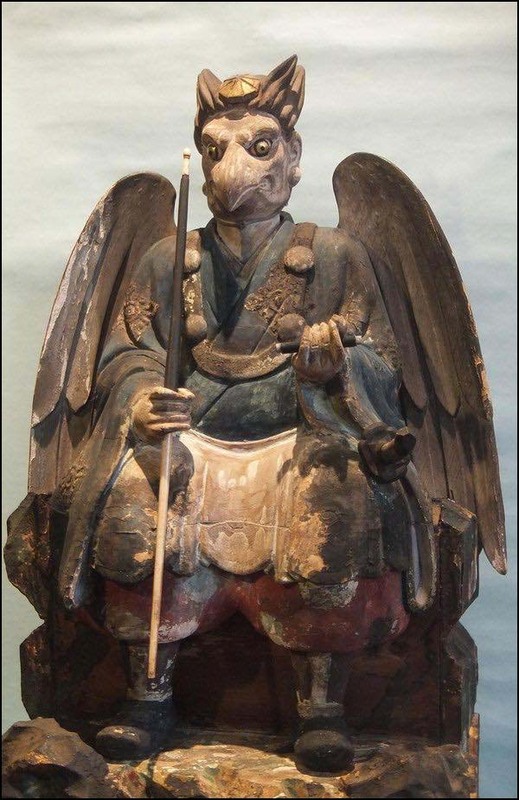 Sarutahiko サルタヒコ is the ancestor of the Tengu.
. shibatengu, shiba tengu 柴天狗 / シバテン Shiba Tengu. Shibaten from Shikoku .
. Tarooboo 太郎坊 天狗伝説　Taro-Bo, Tarobo Tengu Legends . Tengudaoshi, Tengu-daoshi 天狗だおし / 天狗倒し "Tengu knocking down trees"
Tengu tsubute 天狗つぶて / 天狗礫 "Tengu throwing stones"
. Tengubi, tengu no hi 天狗火 Tengu fire .
. hinotama 天狗と火の玉伝説 Legends about Tengu and fire balls .
. inoshishi 猪 - 天狗 と伝説 Legends about wild boar and Tengu .
. kawatengu, kawa-tengu, kawa tengu 川天狗 "river Tengu" . 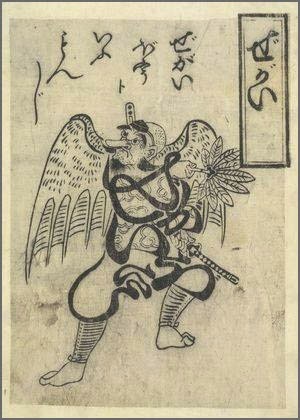 mizutengu, mizu tengu 水天狗 "water Tengu"
. men 天狗の面 mask of a Tengu - Legends .
. Ninnaji 仁和寺 Ninna-Ji and Tengu - Kyoto . and about the Tengu, who dislikes 生鯖 mackerels.
. sugi 天狗と杉と伝説 Legends about Tengu and Cedar trees .
. Yama no Kami, Yamanokami 山の神 God of the Mountain and Tengu legends . ............................................................................ . - - - Aichi 愛知県 . ............................................................................ . - - - Akita 秋田県 . ............................................................................ . - - - Chiba 千葉県 . ............................................................................ . - - - Ehime 愛媛県 . ............................................................................ . - - - Fukui 福井県 . ............................................................................ . - - - Fukuoka 福岡県 . ............................................................................ . - - - Fukushima 福島県 .
. Jigokudani　地獄谷 ”Hell Valley" -- Jigoku no Tani 地獄の谷 .
. - - - Gunma 群馬県 . At the pass 陣ヶ峰峠 Jingamine Toge there is the tea stall 天狗見茶屋 Tengumi Chaya with a room of 8 tatami mats, the 天狗の間 Tengu Room. The son of this family, 仙太郎 Sentaro, was quite a Yakuza hanging around gambling. So the Tengu came to teach him a lesson and waited in front of the house. But Sentaro did not listen to his sermon and instead invited him to come along gambling. The angry Tengu picked up the young man and threw him into the large Tengu Room. Sentaro was quite surprized, fell ill and soon died. That is how the room got its name.
. Urami no taki 裏見滝 waterfall at Nikko .
. Legends from 中央区 Chuo ward .
. Legend from 神田鍋町 Kanda Nabecho district .
. Tengosama テンゴサマ / Tengohan テンゴハン . Tengu in the Toyama dialect.
. karasu　鴉 / 烏と伝説　legends about crow, raven .